Overwhelmingly, this is a guitar that's a lot of fun to play, and you'll look - and sound - good while you're doing so. Nails the look. Excellent value for money. Tones feel and sound right. Logo looks like it was drawn by a toddler. As a brand, Vox has a special place in the heart of British guitar heritage. Its amps, which provided The Beatles' backline and went on to power the subsequent British Invasion, are its best-known legacy, but Vox was no slouch in the guitar department, either. 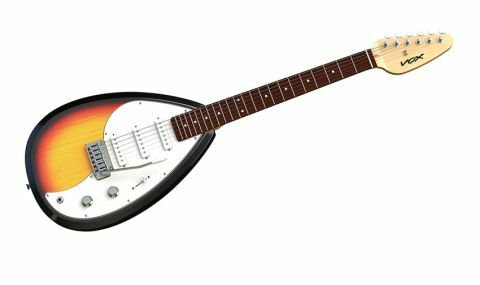 "Brian Jones introduced the public to the Mark III's strange 'teardrop' shape"
Brian Jones was a fan early in his Stones career, playing a custom Vox that introduced the public to the Mark III's strange 'teardrop' shape. He made quite an impression - the likes of Tom Petty, Robert Smith of The Cure and Sergio Pizzorno of Kasabian have since been spotted wielding one - and now Vox, in all its wisdom, has reissued the Mark III. In its soft case, the Mark III looks about the size and shape of a banjo, or possibly some kind of lengthy frying pan. Turn up to a gig with this, and other guitarists will be wondering what you're packing before you even open the case. Plug in, and you're straight into familiar single-coil territory. The pickups are perfectly capable of replicating S-type tones, but the Mark III seems best suited to playing with the bridge pickup engaged, the treble turned right up and a little bit of gain thrown into the mix. It just feels... right, somehow, like you're playing at the Crawdaddy Club in 1963. The neck might feel strange at first, owing to its short scale, but once you settle in, it's a comfortable playing area with plenty of high-fret access - another advantage to that quirky body shape. Vox has clearly spent time nailing that vintage, vibe-y look certain players go for. The little details help complete the picture: the retro tone and volume controls, the white machineheads, the bold headstock shape - it all gives the impression that the guitar was discovered in a dusty Denmark Street basement. Given that, it's a little odd that Vox didn't put more effort into the logo, which looks like it was drawn by a toddler with a felt tip pen.